Find out what top sellers are doing on LinkedIn that you're not! 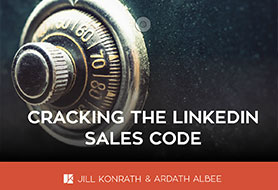 Get the results from our Sales & LinkedIn survey. LinkedIn’s capabilities that top sellers use frequently. Their strategies and mindset that leads to more business. Action steps to better leverage LinkedIn for prospecting.